What's the difference between good TV reception & bad TV reception? The obvious question to ask to address the previous question: is your TV reception pixelating or isn't it? Those little squares on the screen, those clicking noises are signs of pixelation. This would be summarised as - bad tv reception. What are the signs of good tv reception? This is a tricky one with digital. 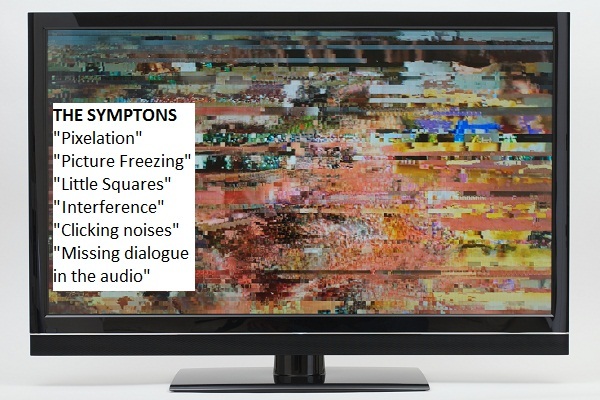 Because digital TV is always clear, you won't know if you have strong signals or not until you notice pixelation. You really could be at the good end of the spectrum or close to the disastrous end - you really cannot tell. If you are using an indoor antenna, you never really can expect good reliable TV reception. If there is thunderous cyclonic weather, you have 6 or more tv's in the house and channel sbs is not pixelating you could be one of the lucky one who has good signals. Where you live plays a big part in determining whether you are going to have good TV reception or not. The higher your location and the more line of sight you have to the transmission towers - the better. Basically, a weak signal. Your antenna system is only as good as its weakest point. Due to there being many points of contact, termination and transfer in an antenna system, the signal loses its 'oomph' at all these points of contact & termination. This loss of 'oomph' is referred to as 'Signal Losses'. Loss of signal strength & signal quality are symptons of a weak signal. Signal loss is normal and to be expected. Without an amplifier there is no gain. Too many TV points off the one antenna can give you more loss than you can afford to lose. So get rid of a few, you're thinking? No, because 500 tv points in a sky scraper still only run off the one antenna. How do you get good tv reception? If you are using an indoor antenna, I can give you a few tips and pointers. Otherwise, you will need to consult some professionals to get it fixed properly. For those of you who are using an indoor antenna, first of all - good luck! Indoor antennas nearly always cause more drama then what they are worth. And if you're thinking of buying a fang dangle one with amplification, depending on where you live - you may or may not be wasting every cent. There are indoor antennas from $100 plus! And for that price you should look at spending that money to just getting a TV point put in/an outdoor antenna installed. An outdoor aerial is recommended. If you already have one of these, how old is it? How old is your cable, joins and splitters? Is your TV tuned correctly? All of these factors play their part in getting good TV reception.